A wedding is a beautiful dream come true. 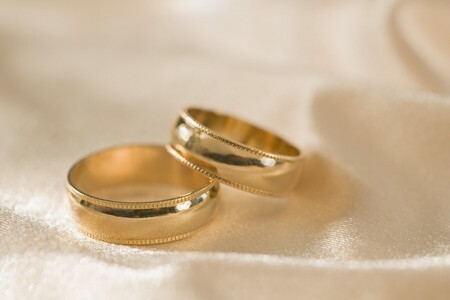 And a wedding ring is the most important ever-lasting souvenir of the lovely ceremony. Many factors have to be considered before finally deciding n such an important thing. A wedding ring is for your whole life. You may not want to rush with something as important as this before giving it any serious thought. You should be ready with the questions you would like to put up to your jeweler, so that you are sure about the quality of the ring. The first step while purchasing your wedding ring is to know the size of the ring. The cost of sizing the ring will depend upon the dealer. You have to ensure that your ring is a perfect fit, not even slightly tight or loose on the finger. Choosing a wedding ring gives you the perfect opportunity to know about your preference in jewelry. While some prefer to keep their rings subtle and not too flashy, others may want something that shines and sparkles even from a distance of ten miles. Once you are sure regarding the size of the ring and your personal preferences, move onto the material of your wedding ring. There is ample variety in metals to choose from. While gold somewhat dominates the market, there is enough variety in silver, titanium as well as platinum. The bride and the groom may have some personal preference regarding the metal. There are people who prefer silver or white gold to the conventional yellow gold. Platinum rings or titanium rings may be very expensive but their prices often fluctuate. These may perfectly suit the taste of some. The next step should be the selection of the stone. The most obvious choice for most people is a diamond. The four factors to be considered during the purchase of a diamond are its Color, its Cut, its Clarity and its Carat weight. These four features are called the 4 “c” ‘s of a diamond. For a diamond, which is the ultimate gorgeous, select one that has a rating of d, e, or f for its color. These ratings indicate that the stone has no yellow traces. An f rated diamond in clarity is the purest in quality and the best buy. The diamond’s cut and its carat weight is your choice. One of the most important things to check while buying a wedding ring diamond is the insurance offered by the dealer for the diamond. The best jewelers are those that offer you a lifetime guarantee for your purchased jewelry. Insure your ring for loss as well as damage also. You should be able to recover and replace your treasured possession in case of any mishap. Although buying the perfect wedding ring maybe a time-consuming process, it is something you will cherish forever. One glance at the ring after many years will be enough to ensure you that all the trouble was worthwhile. Whichever jewelers you are thinking of visiting, check them on the Better Business Bureau. If you plan to buy your wedding ring from an online store, make sure you have done proper research on the company. As you cannot personally see it, you may have no idea what the final product will be till it finally arrives. Select a company that is reliable in quality and has a decent goodwill.